Imagine going up into the attic of an old house and finding a treasure that had not been seen for years. You might become a “history detective” to investigate more about the mysterious object and want to learn about the person who owned this treasure. You might even display this wonderful thing to share with the world. That’s the story of Harriet Penney’s doll, a new exhibit at The National Museum of Toys and Miniatures. This treasure is a 1900s adult-looking doll designed in the style of Charles Gibson’s beautiful magazine illustrations of that era. This “Gibson Girl” doll, manufactured by German doll maker Kestner, was the Barbie® of the early 20th century with a full wardrobe and lots of accessories. She has a jointed body made of soft kid leather and a bisque head. Harriet’s doll is not only beautiful, but she has an attitude. And Harriet’s doll was – and is – fabulous! 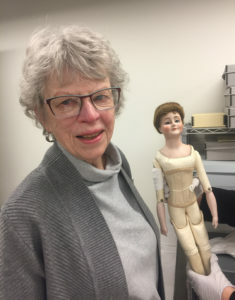 The last year, I’ve been working with Museum staff to explore the history of Harriet’s doll and learn all we can about Harriet Penney and her family. Many questions were answered, and there are great stories to share! In the exhibit you will learn that Harriet Penney was born in 1898, a time when major changes were happening in America with technology, lifestyles, and attitudes. Harriet was given the doll in about 1910 and enjoyed playing with her in the attic playroom of her grandfather’s house in Washington, Kansas, along with her sister. In 1926, Harriet married Charles Roop, and they had three daughters. 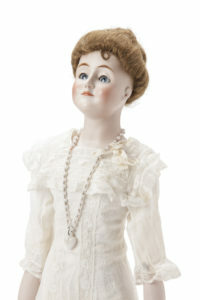 After Harriet died, daughter Patricia inherited the doll, and later donated it to T/M. When the Museum received Harriet’s doll, our curators heard lots of family stories from Patricia. They heard about Harriet’s mother, Ora Yoder Penney, a free-thinking modern woman for her time. She was a postmaster in a nearby small town, worked in her father’s store, wore bloomers, played softball, and was a role model for her two daughters. In 1904, Ora was widowed and moved from Oklahoma to Kansas with her daughters to live with Grandfather Yoder, who built a large house to accommodate his growing family. In our research, we learned that he was a generous man who purchased not only one, but a pair of Gibson Girl dolls: a brunette for Harriet and blond-haired one for her sister, Gertrude. (The location of Gertrude’s doll is unknown at this time.) But there was still much to learn about Harriet and her doll, and many unanswered questions. Who was Grandfather Yoder that he could afford such expensive toys? What were those unusual accessories that came with the dolls? Who sewed the simple, handmade garments for the doll? How did Harriet’s interest in fashion affect her life, and that of her doll? 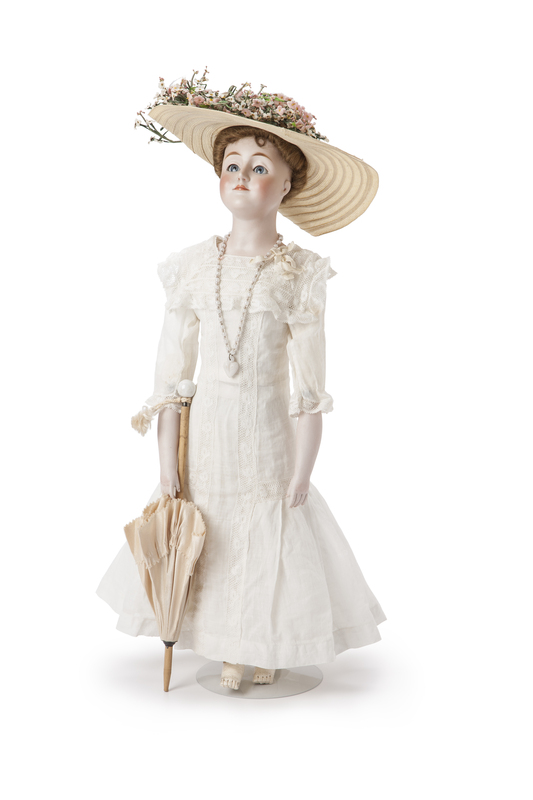 This January, Harriet’s doll will come out of storage where she has been in safekeeping, and the beautiful doll and her accessories will be on display in The Doll Gallery for the first time. It was a privilege for me to get to play detective and solve some of the riddles of Harriet’s doll and the family. I hope you will come to T/M in the next few weeks to see Harriet’s amazing doll and learn her story. On February 10, I will give a program on the process I went through to research Harriet and her doll. Throughout the rest of the year, you may attend some of the hands-on programs related to the doll, read a booklet that tells more of the family stories, play with special paper dolls (yeah!!) and learn for yourself how owning such a fabulous doll enriched Harriet’s life.